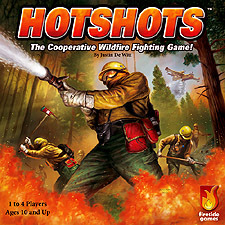 You and your friends are a Hotshot crew called to fight a raging forest fire. Use special abilities, teamwork, and dice-rolling to press your luck against the blaze. Cut Firebreaks, reduce Flames, generate Reward Tokens, and manoeuvre vehicles before 8 tiles are Scorched and the forest is lost!